Mother of Perpetual Help, you have been blessed and favored by God. You became not only the Mother of the Redeemer, but Mother of the redeemed as well. We come to you today as your loving children. Watch over us and take care of us. As you held the child Jesus in your loving arms, so take us in your arms. Be a mother ready at every moment to help us. For God who is mighty has done great things for you, and God's mercy is from age to age on those who love God. Intercede for us, dear Mother, in obtaining pardon for our sins, love for Jesus, final perseverance, and the grace always to call upon you, Mother of Perpetual Help. Her feast day is June 27. The picture of Our Lady of Perpetual Succour is supposed to have been painted in the fourteenth century. It represents the Mother of God holding the Divine Child while the Archangels Michael and Gabriel present before Him the instruments of His Passion. Over the figures in the picture are some Greek letters which form the abbreviated words Jesus Christ, Archangel Michael, and Archangel Gabriel respectively. The original was brought to Rome towards the end of the fifteenth century by a pious merchant, who, dying there, ordered by his will that the picture should be exposed in a church for public veneration. It was exposed in the church of San Matteo, Via Merulana, between St. Mary Major and St. John Lateran. Crowds flocked to this church, and for nearly three hundred years many graces were obtained through the intercession of the Blessed Virgin. The picture was then popularly called the Madonna di San Matteo. The church was served for a time by the Hermits of St. Augustine, who had sheltered their Irish brethren in their distress. These Augustinians were still in charge when the French invaded Rome (1812) and destroyed the church. The picture disappeared; it remained hidden and neglected for over forty years, but a series of providential circumstances between 1863 and 1865 led to its discovery in an oratory of the Augustinian Fathers at Santa Maria in Posterula. The pope, Pius IX, who as a boy had prayed before the picture in San Matteo, became interested in the discovery and in a letter dated 11 Dececember 1865 to Father General Mauron, C.SS.R., ordered that Our Lady of Perpetual Succour should be again publicly venerated in Via Merulana, and this time at the new church of St. Alphonsus. The ruins of San Matteo were in the grounds of the Redemptorist Convent. This was but the first favor of the Holy Father towards the picture. He approved of the solemn translation of the picture (26 April, 1866), and its coronation by the Vatican Chapter (23 June, 1867). He fixed the feast as duplex secundae classis, on the Sunday before the Feast of the Nativity of St. John the Baptist, and by a decree dated May 1876, approved of a special office and Mass for the Congregation of the Most Holy Redeemer. This favor later on was also granted to others. Learning that the devotion to Our Lady under this title had spread far and wide, Pius IX raised a confraternity of Our Lady of Perpetual Succour and St. Alphonsus, which had been erected in Rome, to the rank of an arch-confraternity and enriched it with many privileges and indulgences. He was among the first to visit the picture in its new home, and his name is the first in the register of the arch-confraternity. Two thousand three hundred facsimiles of the Holy Picture have been sent from St. Alphonsus's church in Rome to every part of the world. At the present day not only altars, but churches and dioceses (e.g. in England, Leeds and Middlesborough; in the United States, Savannah) are dedicated to Our Lady of Perpetual Succour. 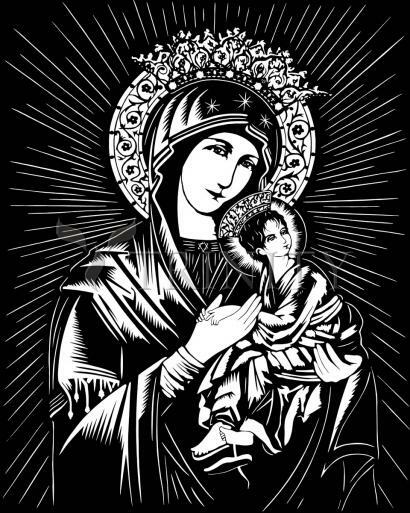 In some places, as in the United States, the title has been translated Our Lady of Perpetual Help.